One of the keys to market gardening success is to plan your market garden to yield a continuous harvest of vegetables. You need to know when you can start selling, and how long you can expect your garden to produce. Here's the factors to consider when developing your market garden plan. Plan your market garden step 1: your growing season. Or perhaps more specifically your harvest season. Figuring this our begins with identify your first and last frost dates. That is, the dates on average for your location when the last frost occurs in the spring, and the first frost in the fall. Frost dates Canada and Frost dates U.S.
Plan your market garden step 2: days to harvest. You next need to know how long it takes each crop you plan to yield a harvest. Start with the seed catalogs; most will give you a 'days to maturity' figure to help your planning. Make note if the 'days to maturity' figure refers to direct seeding, or from transplant. Also note average germination times. Plan your market garden step 3: length of harvest period. This is the average length of time over which a crop will produce a yield. This gives you your re-plant interval. Some examples: beans, beets, broccoli, turnips, lettuce, radishes - replant every two weeks. Cabbage, carrots, onions - replant every three weeks. Crops with longer harvest periods might be planted only 2 or 3 times throughout the season e.g. tomatoes, peppers, cucumbers squash. Potatoes might have two plantings, one for spring and one for fall. Plan your market garden step 4: cold hardiness of your plants. To start your earliest crops, you need to know how tolerant they are to frost. This is usually expressed in relation to last frost date. 5 days germination PLUS 35 days to grow a transplant PLUS 50 days to maturity EQUALS 90 days to grow a broccoli. If my last frost date is May 1, and I can put broccoli in the garden 4 weeks before that, that means I can start my first broccoli seeds indoors around the first of March. And I will have broccoli ready for sale 90 days later, around the first of June. Broccoli yields over about a 2-week period (some plants will mature faster than others) so I will re-plant broccoli every two weeks until 90 days or so before my last frost date. Note that if you protect your plants with row cover, you could push this date by a few weeks. Do this for all your planned crops, and you will be able to determine a reasonable time to begin selling at your market. This is a fairly large task, and the reason I created my Bootstrap Market Garden Planner. 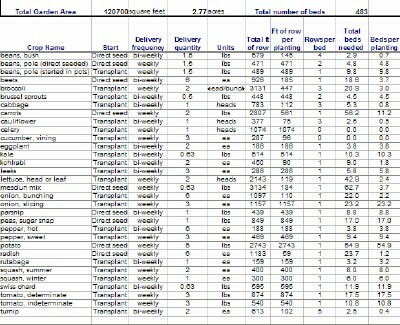 Keep good records of actual yield times and quantities,to make planning your market garden easier next year.